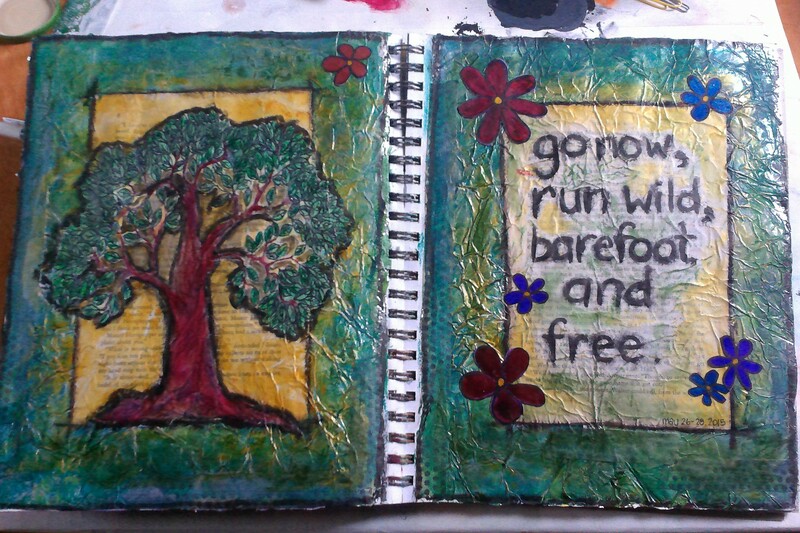 Another journal page. Aluminum background; collage, acrylics and inks. The foil was a pain to work with, but I really like the end result. I’ll probably never use this technique again. 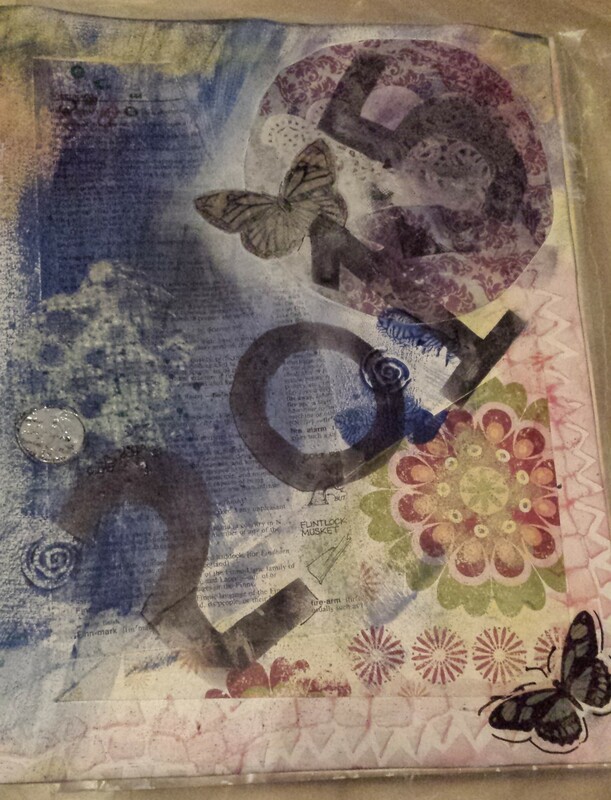 After many years of being in the healing arts, I’ve switched gears a little and have added another modality to the work I do – Creative Journaling. Everyone knows about journaling – about writing down thoughts, ideas, emotions, events in a blank book. It’s a fabulous method for sorting through our stuff, and the insights gleaned can be life-changing. That, and it’s nice to have life events written down somewhere, because the mind doesn’t always remember past things! So what is Creative Journaling? It’s a smash of art, scrap-booking, and journaling – all in one book. The beauty of this kind of journaling is that it doesn’t require lots of words to be written down. That can (and does) happen, but often just by using colour, old photos, quotes, etc. a LOT can be said. That, and it’s fun. And, it gets the creative juices going. And, if practiced regularly (even daily), it helps to reconnect us with our Spirit – that greater part of our Self that knows (better than us!) what is going on, where we’re going, and ultimately how things might turn out. Simply, it connects us to our intuitive voice – our internal guidance system – and when that part of us is activated, wow – great things can manifest in our lives because, when we listen to that inner voice (our heart – not our head), it guides us to places we couldn’t even have imagined we could go. So hopefully this blog (which is going to be all about Creative Journaling) inspires you to grab your journal, some pencils, crayons, markers, paints (or whatever medium you want to use), and go create!